Boamistura is a multidisciplinary crew from Madrid (Spain) with roots in graffiti art. Born in late 2001, the crew was formed by 5 members (Javier Serrano Guerra, Juan Jaume Fernández, Pablo Ferreiro Mederos, Pablo Purón Carillo and Rubén Martín de Lucas) who first met at the age of 15 and became friends while painting the walls of their neighborhood. After they finished their degrees (each of them in different academic fields) they decided to use their new knowledge and take Boamistura to the next level. The name Boamistura comes from the portuguese ”good mixture”and resembles the adequate name for a crew of such kind, drawing references to the diversity of backgrounds and points of views of each of its members. The basis of all Boamistura’s work is the point of a constructive dialogue: sharing ideas, listening to each other and, even at the earliest stage of a proposal, be sure that all the members feel that they are on the right path. Since the crew members have different backgrounds and personalities, there are always different points of view on the same project. All the ideas are put on the table and reviewed together until one idea becomes a clear winner and from that point they start sketching and shaping the project. ”We like to think of Boamistura as a monster with five heads, ten arms and one big heart” as the crew says. Although its headquarter is in Madrid, Boamistura travels around the world, decorating the public space with their work, which they consider a tool to transform the street and to create bonds between people, a tool to humanize the cities, seen as living organisms, so they can interact with their inhabitants. One of the projects that Boamistura is been carrying out is the global artistic project Crossroads. The aim of Crossroads is to inspire people’s heart, involving them in the process of changing or improving their surroundings. Its purpose is to transform the vulnerable communities with high risks of exclusion, through pictorial participative dynamics. The creation of murals not only pretends to do an esthetic improvement. It is much deeper, is to change the people perception of their own neighborhood and their coexistence. The participation is the principal element that frames the project. This way the neighbors became coauthors in the intervention, feeling part of it and capable of changing their own vital space. The ultimate point of the project is to surround the people with an inspiring atmosphere, by increasing their self-stem understanding their sense of belonging as part of a community. Crossroads has inspired Boamistura to develop and implement different projects and has brought the crew to many countries: ”Velokhaya” in Cape Town, South Africa (2011), ”Diamond Inside” in Cape Town, South Africa (2011), ”Luz nas Vielas” in São Paulo, Brazil (2011 and 2017), Spain (2013), ”Al Karama” in Argel, Argelia (2013), ”Somos Luz” in Panamá City, Panamá (2013), ”Vida” in Bogotá, Colombia (2015), ”Sisi ni mashujaa” in Nairobi, Kenya (2016), ”Corrientes” in Antofagasta, Chile (2017) to mention some of them. Boamistura is fascinated with the written word. In their own words: ”We feel that it is the most effective way to communicate. No room for interpretations. A word is simple and direct. It is what it is. If you read a positive word or inspiring phrase, it puts you in a better mood which you then emit to your surroundings”. 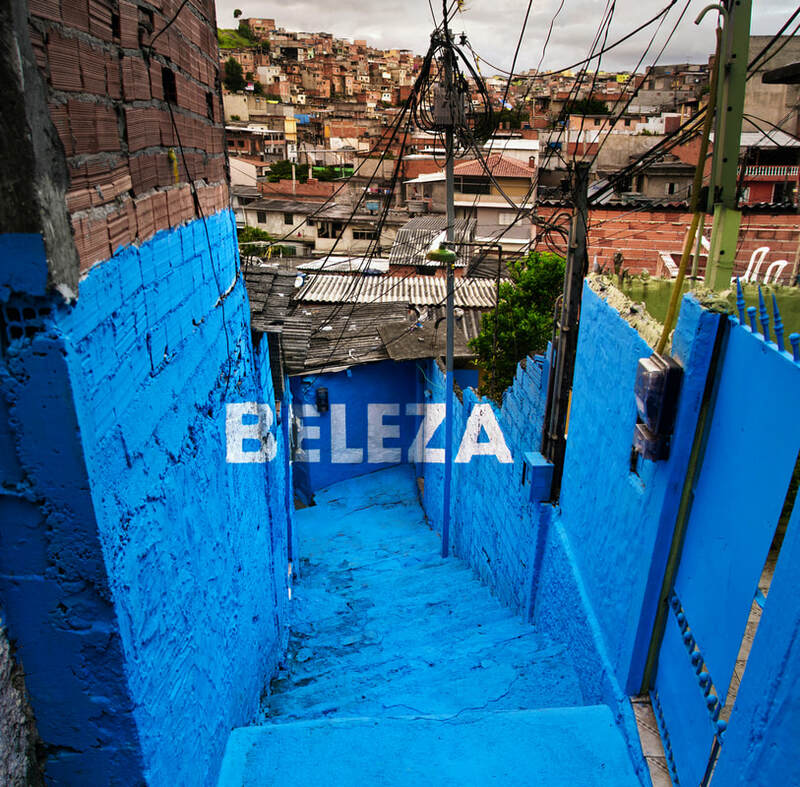 Following this fascination, in 2011 Boamistura carried out the urban art project ”Luz nas vielas (Light in the alleyways)” in Vila Brasilândia, one of the favelas that proliferate in São Paulo’s periphery, under the shadow of skyscrapers. An ocean of houses that extend beyond the limits of the horizon. Structurally, Brasilândia is developed longitudinally, responding to the topography of the hills on which it is located and assuming major roads infrastructure. In second order, transportation elements facilitate access to houses. These ”cracks” are known as “becos” on the flat areas and “vielas” on the stairways, they both are the real articulators for the life inside the community. 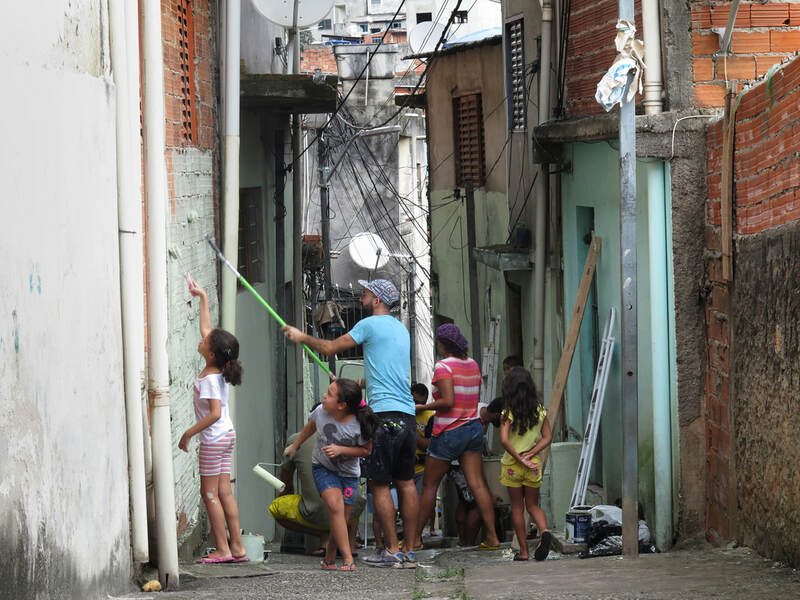 For the project, they had the opportunity to live in a favela with the Gonçalves family. During the first few days, Boamistura realized of the possible framework made by the narrow and winding passageways that connect the up and low urban areas, known as “vielas”. The aim of this project was to respond to this characteristic spatial complexity and synthesize the essence of Brâsilandia. The intervention consisted of painting a continuous color throughout the visual plane, covering all the materials in the same way, flattening the perspective. Later a word is written with the technique of anamorphosis, that plays with the point of view and with the deformation of the letters to create a game with the spectator. “Beleza” is the greeting word used in Brasilândia. The first word that two people say to each other when they meet: Beauty. “Orgulho”: Pride for the neighbor is something that’s missing in these communities. A feeling to awake. 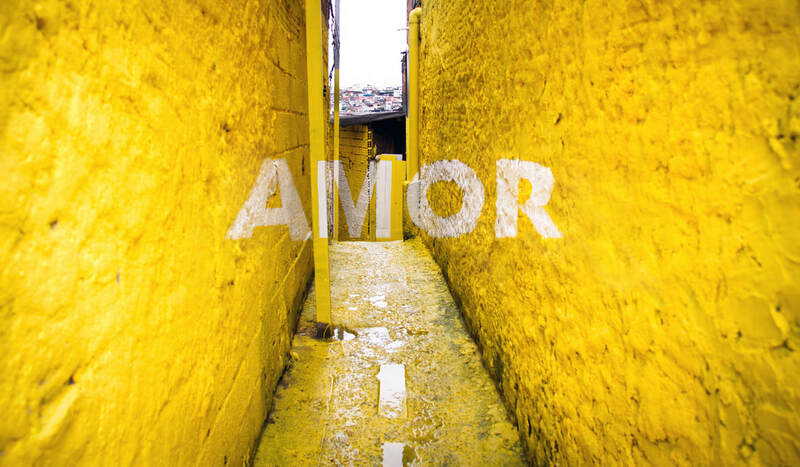 “Amor”: Love is something we lived from the first moment in Brasilândia. A necessary word to break prejudices. 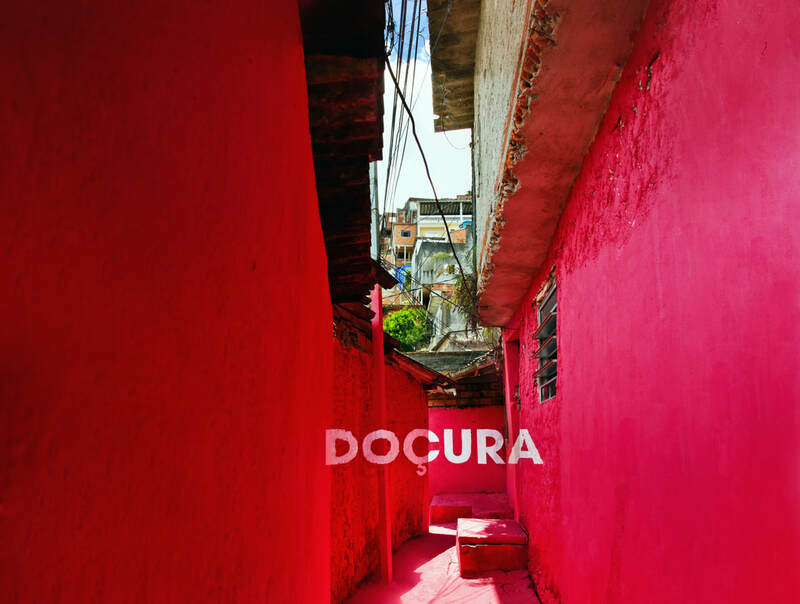 “Doçura”: Sweetness of every kid who painted with us in every street. In terms of process, one of the keys was the neighbors’ participation, who were adding fluently and spontaneously throughout the project. All together, always with the kids in the lead, they were cleaning and painting the alleys. People feel even more proud of the resulting work, when they are the co-authors. 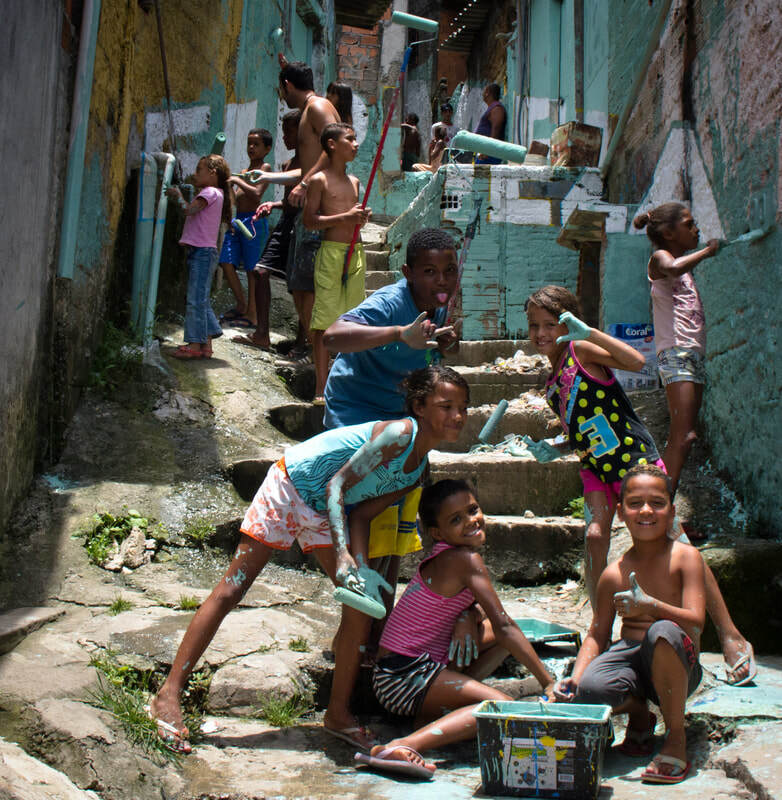 In February of 2017, Boamistura returned to the favela to give continuity to this project. This time the crew added two new words, to extend the radius of action of the initial work. 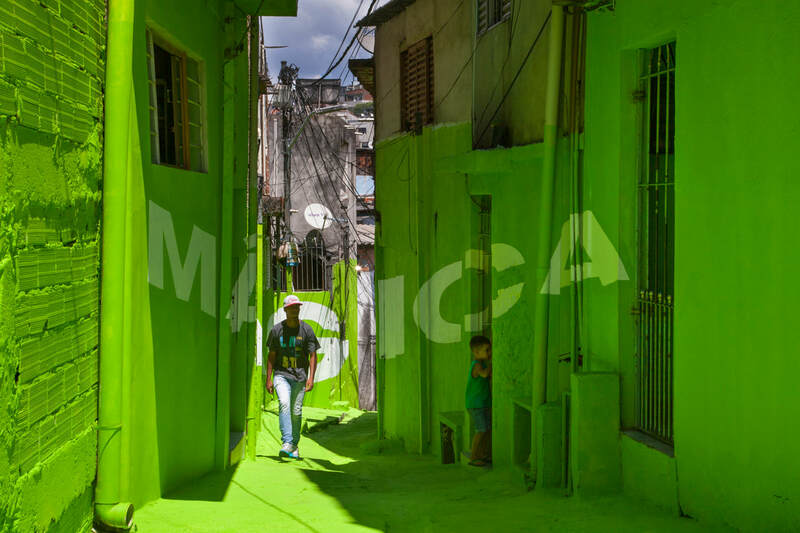 ”Poesia (Poetry)” and ”Mágica (Magic)”, underlining the beauty of informality, the charm of spontaneous urban growth, the intensity of relations between neighbors, the smile of children playing up and down the stairs. 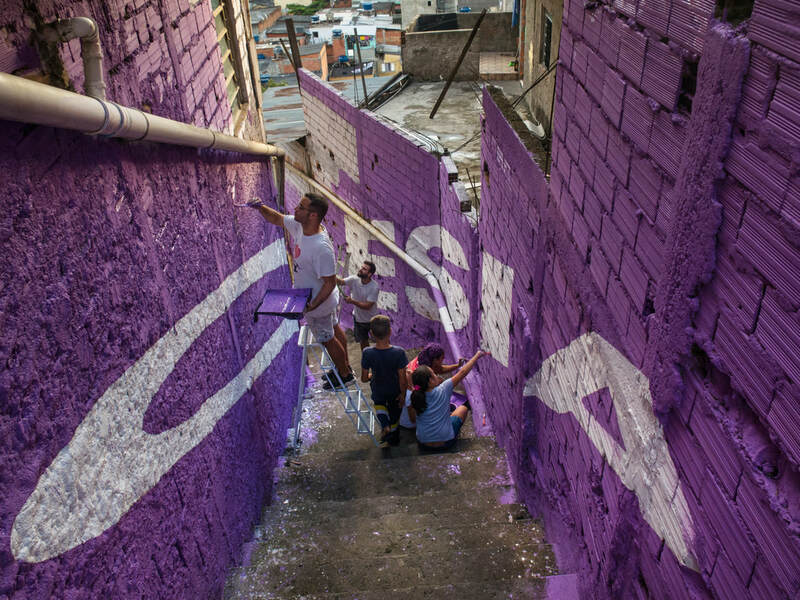 It is with this project that Boamistura learned that urban art can connect people and empower neighbors. ”It’s in these streets where you get to feel the true life of the hood. Where truly makes sense to include people, to create change. This project aims to be a colorful shout in the middle of a brick ocean, in which life is on the edge. Usually municipal authorities turn the back on the outskirts, which we often get to know because of the infamy from the media. 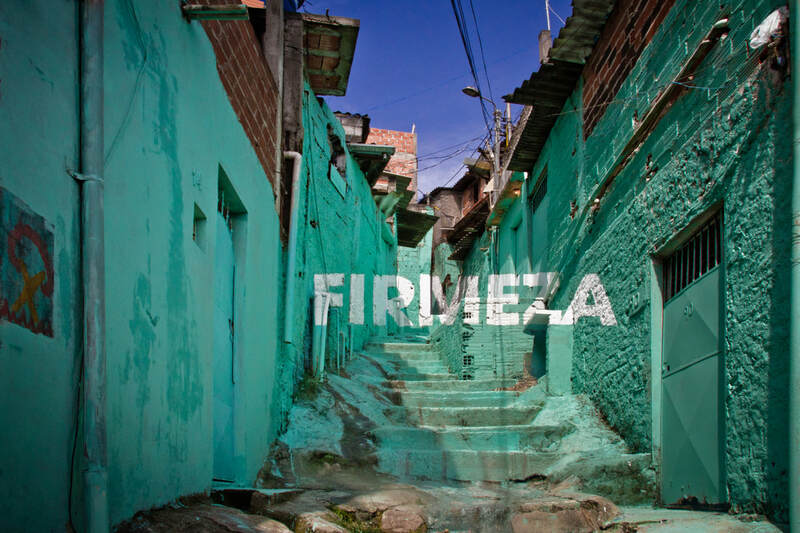 We as urban artists have to reverse that process of negativity, because the favela does not have to be synonym with violence, because life in this place is more intense and real, because “there is no purest and most sincere poetry, than the one that comes from the favela”. ​Boamistura, featured in our magazine ARTICULATE #16. Check out the full release here below.